African Brain Drain - Is There an Alternative? 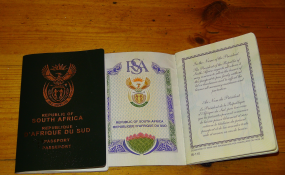 Demand for Foreign Passports Behind Brain Drain or Just 'Plan B'? Will Brain Gain from Diaspora Revive Nigeria's Health Sector? Will the Brain Gain from the Diaspora Revive the Health Sector? Douala — "Brain drain is particularly acute in sub-Saharan Africa," says the World Economic Outlook (October 2016), a report published by the International Monetary Fund (IMF). "The migration of young and educated workers takes a large toll on a region whose human capital is already scarce. The concentration of migrants among those who are educated is higher than in other developing economies. The migration of highly-skilled workers entails a high social cost, as is evidenced by the departure of doctors and nurses from Malawi and Zimbabwe, which may mean welfare losses beyond those that are purely economic." This situation is not new. The African brain drain had already started in the 1980s. In the 1960s, the higher education policies of newly independent African states reflected a need for them to train their own elites. For some, students would be trained abroad, mostly in the former colonizing countries and the Soviet Union. They received state scholarships and were expected to return home to contribute to their country's development. Cameroon, for example, required that all students with scholarships sign a ten-year pledge. Meanwhile, countries in the former Soviet bloc demanded that African students leave as soon as they had finished their studies. They were also encouraged to leave the host countries due to other factors - such as difficulties in finding employment, jobs reserved for nationals, discrimination or downgraded appointments. At the same time, newly independent states offered attractive job prospects for their graduates - reviving their enthusiasm for independence and using laudatory slogans like "Your Country Needs You!" to make them feel wanted. In the two decades after independence, the African brain drain followed the logic of a wider migration movement. Its main feature was that it was temporary - at least in its intention. In the 1980s, this post-independence euphoria gave way to disenchantment in most African countries. Promises of an escape from poverty were not kept. In a series of successive self-imposed "slimming diets", the state apparatus drastically cut back on public-sector recruitment. The ideal of a project for the common good began to fade, and a feeling of futility set in. Getting a diploma no longer had the same meaning, while "employability" became the watchword for educational policy, in Africa and elsewhere. Students increasingly turned towards courses that enabled them to acquire skills that were "saleable" in the world job market. Countries in the North were not unhappy about the migration of skills out of countries in the South, though. They competed for new talent while facing problems in renewing their own workforces. Forecasts of an ageing population and certain policies limiting the number of student places, like the numerus clausus for medical students in France, forced these countries to increasingly turn to foreign labour. They adopted selective immigration policies in an effort to match the skill sets of migrants to the needs of their economies. Faced with a dearth of doctors, France welcomed those from abroad, while Germany attracted foreigners with the skills their industries needed. The health professions, computing, finance and technology, in particular, led the way for greater international mobility. In this sense, globalization gradually opened up national job markets, while encouraging greater standardization in curricula and diplomas worldwide. But, while African countries entered this globalization through the backdoor, in that they did not always have a say in it, the same was not true for individuals. They sometimes benefited through personal educational projects, professional prospects and other possibilities (consumption, travel, etc.) on offer to them. However, while these opportunities may have matched personal development goals, they did not necessarily correspond to the development goals, orientations and priorities of some African countries. Be that as it may, the internal policies of African countries are among the factors that - alongside the demographic trends of countries of the North, and globalization - transformed African migration from being temporary to being permanent. This was migration with no real prospect or intention of returning, and which was not due, as we have just seen, to economic factors alone (jobs, salaries, working conditions) or policies (persecution, insecurity). It was migration as a prospect for life. Today, African countries seem to find it impossible to stop the brain drain. Repatriation strategies at any price are proving to be ineffective, so long as governments do not attack the root causes of emigration. And that priority is not given to retaining brains that are fleeing. One alternative - if not a solution - would be to use the brain power in the diaspora to teach courses in African universities. Such a circulation of skills would open new prospects for African countries at a time of inescapable globalization. For several years now, university and scientific networks have been set up between home countries and countries with an African diaspora. There is, for example, the University of the Mountains in Cameroon, which has formed an alliance with the Dijon University Hospital and the Paris 13 University in France - and with the University of Udine and the Centro Cardiologico Monzino in Milan, both in Italy. Morocco is involving its diaspora through national programmes such as the International Forum of Moroccan Competencies Abroad, which supports national research and technology initiatives. In 2009, the National Centre for Scientific and Technical Research (CNRST) in Rabat signed memoranda of understanding with a number of bodies abroad, notably the Association of Moroccan Computer Scientists in France (AIMAF) and the Moroccan-German Skills Network (DMK) in Germany. Health is an area that would benefit from this kind of cooperation. Cameroonian pharmacists who have settled in Belgium have joined forces with the University of Douala to offer introductory courses in pharmacy. Since 2010, the Association of Cameroonian Physicians in Belgium (MedCamBell) has been organizing professional conferences and public information, prevention and awareness-raising campaigns for Cameroonians. In parallel, certain countries in the North are encouraging "circular mobility", or short-term migration, which enables foreigners to work and to specialize in their vocations for a few years, before returning to their country of origin. This circular migration is supported by the Expert Council of German Foundations on Integration and Migration, the German Agency for International Cooperation (GIZ), under its Triple Win programme, and Germany's Federal Employment Agency. Circular migration benefits both the country of origin as well as the host country, through the transfer of skills and knowledge. And we shouldn't forget the subjects of all of these initiatives - who are learning by working, who form professional links that might prove useful, and who can earn a better living during their stay abroad, which they can then invest in the economy of their countries of origin someday. Similar mutually beneficial practices between host country and country of origin operate in the academic world, especially in the United States and Canada, and to a lesser extent, in the United Kingdom and France. African universities with links to higher education and research institutions in these countries are piloting a programme of cooperation with their country of origin, supported by these overseas institutions. In 2010, Mahmood Mamdani, who was director of the Institute for African Studies at Columbia University, New York (from 1999 to 2004), created the Makerere Institute of Social Research at the Makerere University in Uganda. In 2016, Ousmane Kane, who holds the Chair of Contemporary Islamic Religion and Society at the Harvard Divinity School in the US, started an academic exchange programme for students from Senegal, his country of birth. There is a long list of African researchers and academics who are helping to regenerate higher education and research in their countries of origin, through teaching and research programmes and co-publication projects. The integration of the African diaspora in the global skills market offers them some assurance that they will remain competitive, instead of experiencing the sclerosis they suffer if they stay in their country of origin - because of the poor working conditions and an environment that does not favour professional success. This is particularly the case for lecturers, researchers, health personnel, and more recently, the so-called cutting-edge professions like Information Technology (IT), telecommunications, finance and biotechnology. As the IMF report points out, African diaspora networks "can also provide rigorous professional development and leadership training programmes. Combining their skills, contacts, and know-how with their insight into global opportunities and local customs, diaspora networks of emigrants may help strengthen the home-country business environment, raise efficiency, and expand into new markets." When we make the effort to transform the brain drain into brain circulation, it can pave the way for new forms of cooperation, new modes of development for African countries and new forms of influence that can draw strength from international socialization.